He travelled to New York from Bermuda on His Majesty’s Secret Service. In May, 1941 Britain’s World War Two Naval Intelligence Director Admiral John Godfrey and his personal assistant Lieutenant Commander Ian Fleming [pictured] — a pre-war foreign correspondent and future author of the James Bond novels — arrived in New York from Bermuda on a mission that ended up changing American espionage operations forever. “The two men flew KLM [from the UK] to Lisbon and then took the Pan Am Boeing 314 seaplane via the Azores to the British colony of Bermuda, 600 miles east of North Carolina, where the first American garrisons were building a base to help protect what President Roosevelt called ‘the Western Hemisphere’,” writes author Nicholas Rankin in his newly-published book “Ian Fleming’s Commandos”, the story of the 007 author’s real espionage activities during World War Two [1939-1945]. Admiral Godfrey and Commander Fleming spent several days on the island, being briefed on the activities of the massive British espionage infrastructure which set up in Bermuda soon after the outbreak of war between Britain amd Nazi Germany. “Hamilton, Bermuda was where the British had set up the Imperial Censorship and Contraband Control Office to read the world’s mail, taken off transatlantic ships and planes,” says Mr. Rankin. In his just released Oxford Unversity Press book, award-winning former BBC producer Mr. Rankin says while the US first objected to the censorship system, the Federal Bureau of Investigation [FBI] soon realised how useful the Bermuda operation was when it began to expose foreign enemy agents on US soil. The US was officially neutral in World War Two until December, 1941. But after the US provided 50 destroyers to the Royal Navy in 1940 in return for 99-year leases on a chain of strategic Atlantic bases in Bermuda, the Bahamas, Antigua, St Lucia, Jamaica, Newfoundland, Trinidad and British Guiana, ties between the British and American militaries began to rapidly strengthen. On arriving in New York from Bermuda, Admiral Godfrey and Commander Fleming met “Little Bill”, the Canadian industrialist and espionage chieftain William Stephenson, and his American friend and ally “Wild Bill”, Colonel William J. Donovan. “The bullish Bill Donovan — a WW1 Medal of Honor winner and New York lawyer — had twice travelled to the war-zone on unofficial inquiry missions for the US president,” says Mr. Rankin. “All doors had been opened for him: Winston Churchill was eager for American help. Donovan had got on well with Admiral Godfrey in London in July 1940 and had met Fleming in Gibraltar in February 1941. The other Bill, “Quiet Canadian” Bill Stephenson, had been sent to the USA in June 1940 by the British Secret Service with the mission of improving relations with J. Edgar Hoover’s FBI while also coordinating all UK intelligence activities in North and South America, the Caribbean and Bermuda. During their trip to the US, Admiral Godfrey and Commander Fleming, working in cooperation with William Stephenson — who retired to Bermuda in the 1960s — proceeded to help Col. Donovan lay the groundwork for America’s Second World War intelligence service. Prior to the creation of the Office of Strategic Services [OSS] the US never had a permanent intelligence agency, so Commander Fleming wrote a 72-page memo for Col. Donovan on how a US secret service should be set up and structured. Later he went on to suggest that his advice on establishing the wartime OSS had been instrumental in forming the charter of its post-war successor — the Central Intelligence Agency. 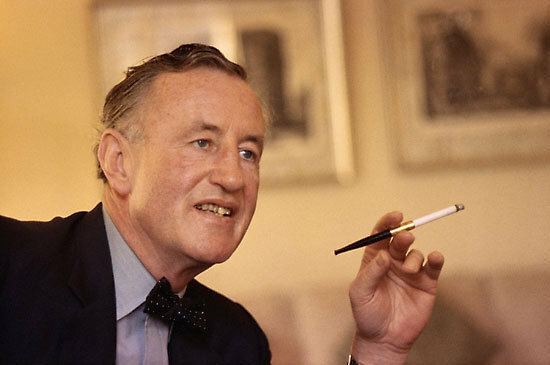 Ian Fleming [1908–1964] was best known for creating the fictional British spy James Bond and for the 12 novels and nine short stories he wrote about the character, one of the biggest-selling book series of all time. One of his James Bond stories — “Quantum of Solace” — is set in Bermuda. His wartime colleague and friend William Stephenson died in Bermuda in 1989 at the age of 92 and is buried at St. John’s Church, Pembroke. Nicely put together Bernews. Fascinating piece of history. Perhaps, in the future a Movie could be made of Ian Flemmings life, now that would be a real thriller!